Alaska cruise themes: whales, photography, wine/culinary, smooth jazz, Jack London/John Muir. Guests booking one of six theme cruises aboard American Safari Cruises’ Safari Endeavour this summer in Alaska will receive a $518 travel credit per couple. The travel credit celebrates the vessel’s inauguration into the upscale fleet during a May 18, 2012 christening ceremony in Seattle. “Adding these experts and performers on board injects another exciting element to each cruise,” said Tim Jacox, executive vice president of sales and marketing. “It’s an added value for guests." Guests booking one of six theme cruises aboard American Safari Cruises’ Safari Endeavour this summer in Alaska will receive a $518 travel credit per couple. The travel credit celebrates the vessel’s inauguration into the upscale fleet during a May 18, 2012 christening ceremony in Seattle. The 86-guest Safari Endeavour sails week-long adventure cruises round trip Juneau, Alaska from June to August and spends two days exploring inside Glacier Bay National Park with opportunities to hike and kayak with park rangers. Six theme cruises feature guest presenters and performers. July 8, 2012, Found: John Muir’s Alaska: Professor Paul Hunter brings John Muir’s and Jack London’s Alaska alive. Includes a dog sledding tour in Juneau. July 22, 2012, Seeing Beyond the Obvious: Learn new photography techniques from award-winning photojournalist PF Bentley whose documentary career spans 30 years. July 29, 2012, Smooth Sailing—Smooth Jazz: Jazz lovers unite for live entertainment in the lounge on select evenings. Paul Richardson plays keyboard and Josephine Howell sings—both top artists currently playing in the Pacific Northwest. August 5, 2012, Travel Photography: Peter West Carey brings his passion for travel and photography together to share tips, tales and techniques. August 19, 2012, Napa Valley Reds—Wine and Culinary: Cyril and Blakesley Chappellet present their legendary Cabernet Sauvignon and other highly acclaimed wines. Enjoy wine and food pairings on select evenings along with a special dinner. Travelers making a new reservation aboard one of the Safari Endeavour’s theme cruises receive a $518 travel credit per couple. The credit is good for bookings made between March 1 and May 18, 2012. The Safari Endeavour will be fresh from a major renovation project adding American Safari Cruises’ yacht-like amenities on board including a wine bar, library, four suites with step-out balconies, massage rooms and hot tubs. The inclusive cruise explores Icy Strait, Chichagof Island, Baranof Island, Frederick Sound, Thomas Bay, Ford’s Terror and Endicott Arm and spends two days exploring Glacier Bay. Kayaks and stand-up paddle boards are available for excursions. Skiff rides will explore shoreline, wildlife and glaciers up close. Expert naturalists and guides lead excursions on land and sea. Cruise fares aboard the Safari Endeavour start at US$4,795 per person based on double occupancy. The inclusive cruise includes all from-the-yacht activities and equipment; transfers; exquisite meals; fine wine, premium spirits and microbrews; one massage, and all port charges, taxes and fees. An all-American crew has a guest-crew ratio of 2.5 to 1. Yachts can be booked as a private charter or by individual stateroom. To book a yachting adventure or to request additional information, contact your travel agent or American Safari Cruises at 888-862-8881 or email sales(at)InnerSeaDiscoveries(dot)com. Editor’s note: Photos available in the image gallery or through Sarah Scoltock at sarahs(at)InnerSeaDiscoveries(dot)com. 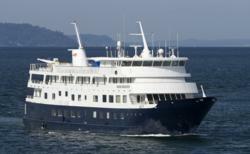 InnerSea Discoveries offers moderately priced adventure cruises in Alaska. Operations began in May 2011. American Safari Cruises, a division of InnerSea Discoveries, pioneered yacht cruising in Alaska in 1997 and has since expanded into Mexico’s Sea of Cortés, Columbia & Snake Rivers, Hawaiian Islands, and Washington & British Columbia. Both brands are owned by long-time industry veterans Dan Blanchard and Tim Jacox who are accomplished adventurers and businessmen with a combined total of more than 60 years in the small ship cruising business. InnerSea Discoveries and American Safari Cruises as a company is a member of Trusted Adventures, dedicated to the highest standards of small-group travel and to giving back to the places visited. Connect with InnerSea Discoveries on Facebook and Twitter.